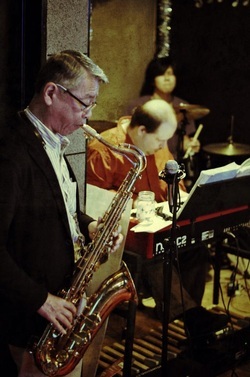 groovy swinging organ Jazz, meets Jazz vocal meets kayokyouku!!! We have live Jazz every night with The Eddie Landsberg Trio or Quartet　or special guests. The style of music is very funky, swingy groovy organ Jazz -- with an emphasis on blues, standards and soul Jazz. Special guests, often top level pros sit in at our shop. There are also special sessions.